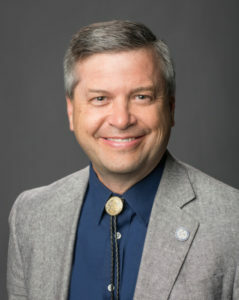 Regent Jason Geddes was appointed by Gov. Kenny Guinn to serve on the Board of Regents in 2006 and was retained in the 2008 election as the representative for District 11. He currently serves as chair of the Academic, Research and Student Affairs Committee and the ad hoc DRI President Search Committee. He serves as co-chair of the Athletics Committee. He is also a member of the Community College Committee, Health Sciences System Committee, Investment Committee and the ad hoc Chancellor Search Committee. Geddes: I always wanted to serve since being in student government and going to the Regents’ meetings. I thought it was the best way for me to give back to the higher education system that has given me so much. Geddes: I think I bring my scientific background to analyze and work to solve problems. I also think I work well with others and can help to build consensus on various issues. I have been involved with higher education in Nevada off and on for nearly 30 years. Geddes: The proudest is going to commencements and watching so many students graduate. It gives me hope for the future of our state. I am also proud of helping to guide NSHE through the Great Recession and to lead the Board through strategic visioning to align the System’s goals with the state’s goals. Geddes: I think we have opportunities to train and retrain the citizens of Nevada for the new Nevada economy. I also think we can grow the universities into Carnegie R1 institutions. I think the biggest challenges will continue to be a need for more resources to grow the institutions and to deal with new technologies and new learning platforms. Geddes: I spend a lot of time in the community and on campuses discussing ways to improve NSHE’s service to the community. This includes interacting with the K-12 system, community service groups, business organizations and students, faculty and staff.